Jeremy Blaustein recently posted this incredible photo on his Facebook page, from recording Snatcher, which he has given permission to be shared elsewhere online. It's such a great snapshot from an interesting period in history (the change from cartridge to CD-ROM), that I'm reposting it here. Click the photo for a larger image. 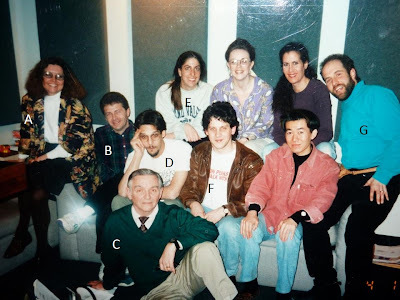 The only Snatcher recording session photo. 1993. Historic. Most people agree this is the first video game ever made with good voice acting. — with Lucy Childs, Jim Parks, Jr., Ray Van Steen, Michael Blaustein, Susan Mele and Jeff Lupetin. The Facebook page had tags, so I've had to add letters for ease. For a detailed character gallery, check out out THIS PAGE. Although their names weren't tagged, I presume the two ladies in the background, next to Susan Mele, are Kimberley Harne (Mika Slayton) and Lynn Foosaner (Katrina Gibson; Lisa; Telephone Operator). Or possibly the other way around. Photos like this, taken using actual camera film and then later scanned in, are great. The fashions, the lighting, the texture that genuine camera-negatives give a photo, all add to the atmosphere when conveying that moment in time. I often wonder why we don't see more such photos from such events - perhaps no one thought to take them, or perhaps they're sitting in a drawer somewhere? Regardless, it's excellent to see these things resurface years later. Snatcher was a defining moment in games for me, from when I first saw previews of the original and then later when I saw previews in GameFAN on the PS1 update, to when I was lucky enough to find someone selling their Sega CD games in a local paper, and then playing it and describing it to friends, none of whom had any idea what I was talking about because no one owned a Sega CD and they were all about the PS1. Their loss I say. And as others have said, the acting really was top notch. Also, is it just me or does Jeremy look a bit like Ryo Hazuki in that leather jacket? It's worth noting HG101 has a lengthy interview with Jeremy, including his work on Shenmue. Check it out HERE if you hadn't before.